Nothing terrifies Samantha Powell more than starting over, but after devoting three decades to a troubled man and an unhappy marriage, Sam finds the courage to seek her own happiness. She imagines a nice quiet life filled with friends, family, and a career that leaves no room for relationship drama. Unfortunately, no one told the alluring Grayson Kinkaide. After escaping a bad marriage of his own, Grayson realizes his soul mate is still out there and his heart is set on Sam. Their instant attraction begins a steamy affair, but the women of Grayson’s past aren’t ready to let him go. Can Grayson convince Sam that she is the only one for him? 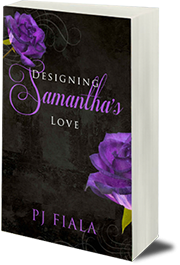 “Designing Samantha’s Love” is a steamy romance that contains sexual content.